Christmas includes the traditional Christmas tree decorated with ornaments and lights. The homes get a thorough cleaning, furniture is varnished, and often new curtains are hung. The holiday season includes gift giving, Christmas cards, music and masquerades. 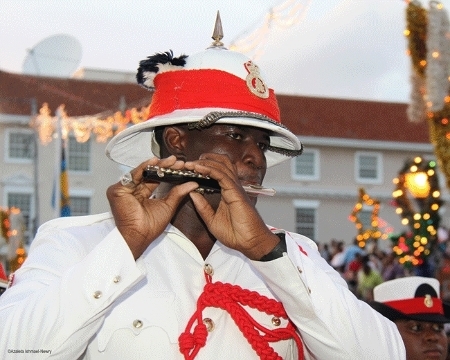 Right before Christmas Day carolers can be heard throughout the island at many public places. 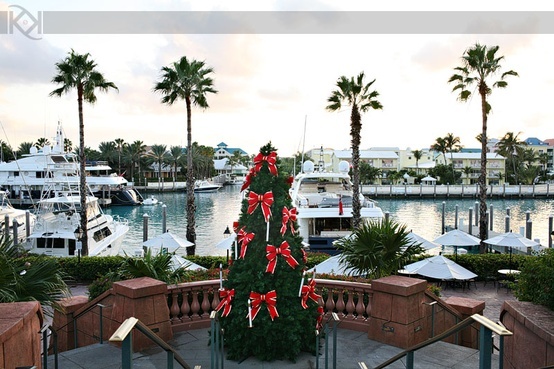 Many other holiday related events such as Christmas and Food Fairs, and concerts are held throughout Nassau, Grand Bahama, and the Out Islands. Of course food is a central part of the holiday celebration. Christmas morning breakfast consists of boiled fish, which is also served throughout the year - but is a tradition during the holiday. Dinner is centered around baked turkey and stuffing, ham (glazed with cherries, pineapple and brown sugar), pigeon peas with rice, yams, macaroni and cheese, and salads such as coleslaw and potato salad. Other island favorites are guava duff, pepperpot, pickled onions and ham. I was not familiar with "Guava Duff" and had to do a little research to find out exactly what this was. Dough is spread with guava, rolled into a jellyroll, then wrapped in cheese cloth and boiled like pudding. The sauce that tops the pudding mixture is made of butter, sugar, cream, condensed milk, nutmeg, rum or brandy. Desert includes coconut creams, pound cake, rum cake, peanut cakes, and fruitcake. Favorite Christmas drinks are ginger beer, sorrel, mauby, rum, wine, and a fermented drink called sweet potato fly. After all the food and drink, it's time for relaxation and sleep. For those who did not attend Christmas morning religious services, many will attend mid-night services. Then at 2:00 a.m. on December 26, another completely different holiday celebration starts - It's time for Junkanoo! 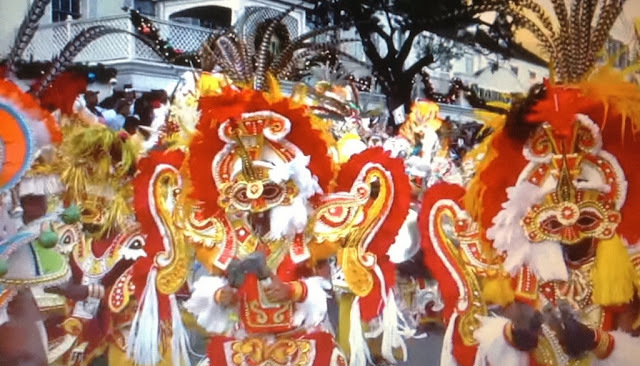 In the wee hours of the morning the streets of Nassau come alive with thousands of parade participants ready to hit the street. It is known that only the best groups perform, and at the first sound of the drums, cowbells and whistles this spectacular party begins. 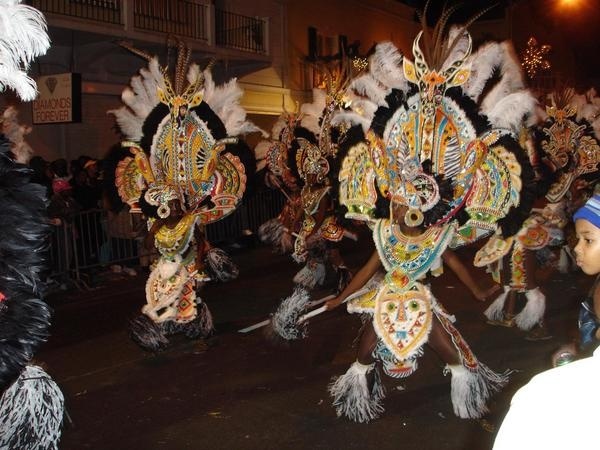 You have to experience Junkanoo to appreciate the thunderous sound which vibrates off the buildings and concrete streets. There is an enormous energy going back and forth between the parade participants and thousands of spectators. Other Junkanoo celebrations are held on Grand Bahama, Eleuthera, Bimini and Abaco - but there is nothing in the Bahamas like the thunderous sound and rhythm of Nassau. To get the best viewing spot, plan to arrive way before 2:00 a.m. You need to reserve seating upstairs on Bay Street, along with the bench seats on the street. If you want to get up close to the celebration, join the thousands of locals and visitors on the streets. Junkanoo re-starts again promptly at 2:00 a.m. on New Years Day for another round of the spectacular masquerade parade and partying.